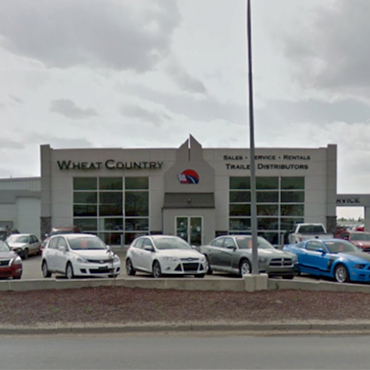 With over 30 years of business experience serving you, Wheat Country Motors has been since 1988 and continues to be your preferred trailer and used car and truck dealer in Regina. We serve North Battleford, Estevan, Weyburn, Carlyle, Stoughton, Saskatoon, Moose Jaw, Prince Albert, Lloydminster and all of southern Saskatchewan from our Regina office. Thank you for visiting our all-new website. We specialize in in providing affordable, reliable pre-owned cars, vans, SUVs and trucks, every one of them fully inspected for your peace of mind. We are proud to serve you in the rural tradition and offer you a unique and nice selection of certified and late-model used vehicles in Regina! At Wheat Country Motors, we know our trucks and cars! In addition to sales, we provide maintenance and repair services for both individuals and commercial fleets. We also offer specialty truck, van, SUV and car rentals and leasing for motorist needs in the Regina and surrounding area. "Retailing used vehicles is a challenging business. Our reward comes out of earning your trust. Our customers give us their repeat business, and refer their friends to us. This has become our measure of success in the Regina and area community." You can shop at Wheat Country Motors with complete confidence that you will have a pleasurable and worry-free buying experience. A thorough inspection and maintenance process is performed. All Wheat Country Certified Vehicles feature our 90-day written warranty. Plus we have a complete diagnostic (import and domestic), full-service repair department - including warranty-approved scheduled maintenance. Trailer Distributors Canadawest is our OPEN and CARGO TRAILER sales division. We represent five excellent manufacturers from both Canada and the U.S.
Our aim is to be valued in the community as a reputable business that provides top value through a quality product at a fair price. Expect a warm welcome, honesty, integrity, a firm handshake and a look in the eye! "Serving you in the rural tradition"